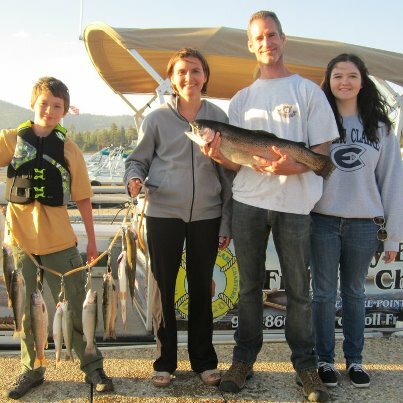 Hey, for all you fishing enthusiasts out there, just found out the latest on the lead in the Lucky Lunker Contest put on by our favorite top team fishing guides in Big Bear, Trish & Mike Marzell from Lucky Bear Fishing Charters. Apparently, over the July 4th holiday the lake has been very generous to one man in specific. Bayard Johnson was trollling with Lucky Bear on July 3rd, 2012 and he caught this 7.14 lb beautiful bow! This catch makes Bayard the leading contender in the Lucky Lunker contest up to this point. Our guests who have taken a trip with Mike & Trish have all come back raving about the time they had. We can't say it enough, you just haven't lived until you take a trip on the lake with professionals who not only share their secrets but also are generous with their hearts and want to ensure all their guests go home with special memories to cherish for years to come.